If you are a teacher in New Zealand do you use Digistore? Until I attended Ulearn11 I have to admit I hadn't. I knew of its existence and had looked at it briefly last year. At least I knew my school log on and password which helped me, when I decided to explore it further, having attended the workshop about Digistore. 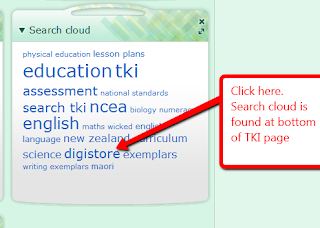 As there is a copyright clause for it, only New Zealand teachers may use it. Perhaps in the future that will change. 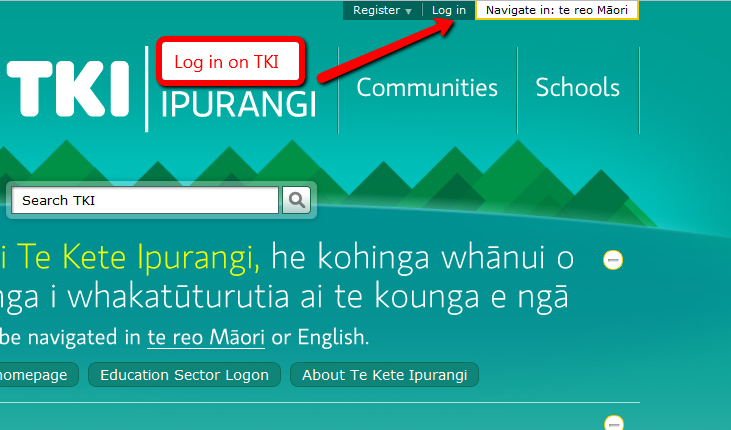 To start with you need to log on to TKI using your sector service log on. Once you are logged on to TKI scroll to the bottom of the page and click on the digistore. The very first time you do this you will need to have your school log on details for logging on to the digistore. Once you have put this in, every other time you will only have to sign into TKI, and you will be able to access the digistore without having any further log on necessary. Once there explore around, especially take notice of the wiki, which is a great place to go to, to learn various things about how the digistore operates. After you have had an exploration time you can begin to build your own learning pathways that can later be shared with students. Today I have begun to do that, I was keeping in mind the needs of my students and the poetry topic we are going to be doing. I made a folder called Poetry and then I added various learning objects I found to the folder. These together make up my learning pathway. Inside my learning path there are the learning activities for my students to engage with. 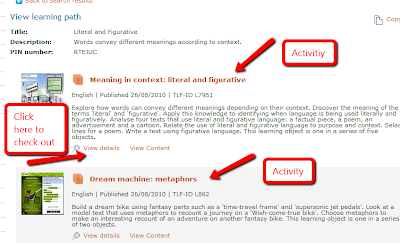 Before I added the learning activities I had clicked on View details to check it out, you do need to work through the activity yourself to decide on its relevance. Having worked through the above activity, I am impressed and I know it will be a valuable addition to the unit of work. 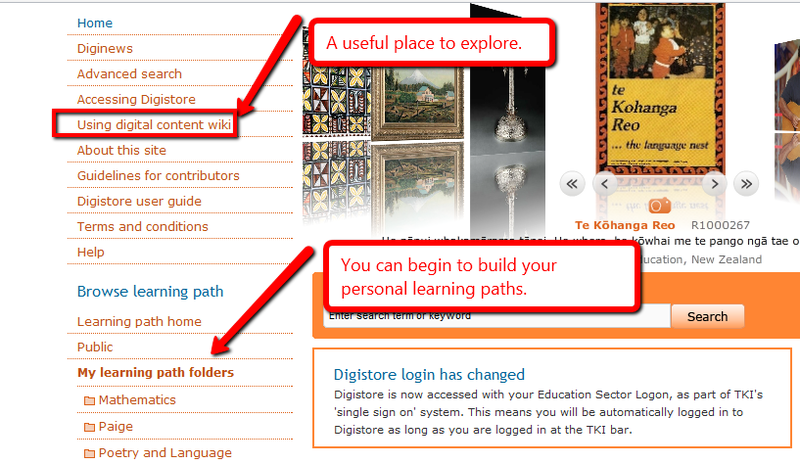 When my learning path is ready, I post a link to the digistore on my wiki, on the poetry page, for the students. I have placed the pin there that they will need to access the learning pathway. They only need this pin to access it, they do not need to log on with passwords or emails. I am now looking forward to trying out the learning pathway I have created with the students when the right moment in the unit arrives. 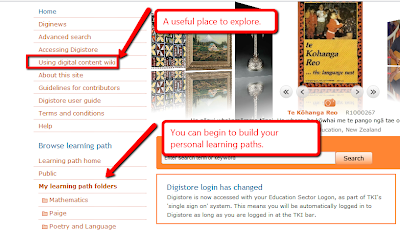 If you have not tried digistore then perhaps start with this slideshare presented by Suzie Vesper at #Ulearn11. She explains it all far better than myself! However I was practising using Jing rather than the snipping tool I usually use! Thanks Suzie for the enthusiasm and great presentation. First Taste of a ULearn Conference. 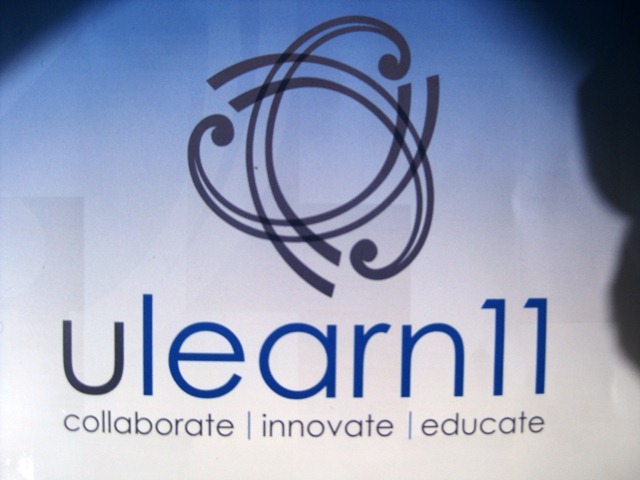 I have just returned from an amazing three days of professional learning at ULearn 11. It was outstanding as a learning experience and sweeter still because I had chosen to do it myself. I mainly funded it myself, although my school did make a contribution which was gratefully accepted! To think a year ago, I had never heard of ULearn. Thanks to an Australian teacher who made me curious enough to find out more I entertained the idea of attending, and did. The keynote speakers were all excellent, however my favourite one was Simon Breakspear and it is to his keynote that I will return. His ideas were inspiring, some of his imagery memorable. What an amazing speaker, he knew how to reach his audience and engage them. I felt he deserved a standing ovation! I should have stood and given him at least a one person standing ovation! I hope his speech will be put on Edtalks, I want to listen to it again and reflect further. In the meantime I hold an image of a dandelion in my mind. I will come back to it to a post all by its own. In the breakouts each of the teachers presenting, were great models of organization and excellent presenting. I marked them all at the top of the scale: they had prepared, were articulate and had a worthwhile something to share. Well done to each of them. I listened of course to only a few of the many options. Not my first choices as I was about 36hrs late when the choices went live online. However I am sure I was not short changed. I look at my planner sheet of breakouts now, and I admit I am a little hazy as to what each speaker said. However my mind is brimming over with thoughts and ideas to use in the classroom or to think about. · 4. Bringing Literacy to You: transformative possibilities for teacher professional learning. I went to the Digistore workshop by accident! It was the last workshop of the conference, I was in a rush, read the event centre incorrectly and found myself in the wrong place. I had been meant to go to Interactive Media – Gaming for Schools on the Cutting Edge (The Easy Way). I had chosen it because it was something I knew little about and thought it might push me! However I was very satisfied with the Digistore presentation, and have it as a top priority to use. It is copyrighted so it is only available to New Zealand schools. I knew about it, but had sort of ignored it, now I can’t! 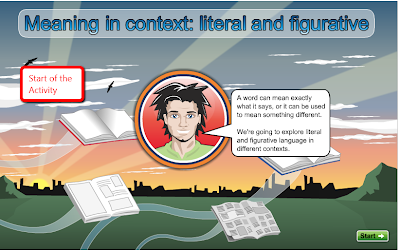 I was inspired by the Literacy presentation – No 4 – and I will explore it further. There is professional development linked to it, if I chose, so I will think about it. Earmarked for another post. No 6 -The e-Learning Classroom Project sounded amazing, and I was somewhat envious of the teachers who have grouped together in this project. This too is earmarked for another post. All the other breakouts were at the least interesting and at the best inspiring. I know I want to take the time to go back and explore the notes online from each speaker, and refresh my mind on what I heard. There were a huge group of people, over 1500 at least. I met only one person that I knew in that ever changing sea of faces! However as we sat on buses, queued up in lines, sat beside each other there was always someone to chat with. I have just finished reading this excellent book by Donalyn Miller. I found it easy reading, and was through it in a couple of days. However I am now intending to do a re-read and gather up what I missed in the first reading. I grew up in the'50s where I was forever scrounging and seeking out books that weren't there. No town or school library, and a meager class library. Oh to have been in such a classroom as D Millers. She believes that students should have plenty of books available to them to read, and that they should be of their own choosing. She also believes that this type of reading can be done during the school day. Now that kind of thinking is not foreign to me, New Zealand schools have long been places where we could choose the materials we teach with. We have no prescribed basal readers or course that we have to follow. Just standards our students must reach. During my teaching career students have always chosen their own books to read in class. This said, D Miller is advocating more than that, and that is where I found her book helpful. I have recently become aware of the Daily Five and Café books by the sisters Gail Boushey and Joan Moser, and have implemented their ideas as well as I can. Of course as always, it was a fine tuning of my teaching rather than a radical shift, especially with the Café book. However the Daily Five did involve some small radical changes – throwing out many desks for one! The Book Whisperer calls for more fine tuning, and it challenges me as well. Daily Five is working well, its magic, as all of we teachers who have implemented it can attest to. In spite of this I still had a query in my mind as to the accountability of students in their reading. The Book Whisperer answers this question for me. If you are wondering about it then read the book, like me you will find answers. I admit I have never been a great reader of children's literature, I enjoy the books I read to my class and there it stops. I now realise I need to read more of them, so I am starting with a goal of one per week. I have just grabbed from our school library Inkheart by Cornelia Funke. D Miller mentions it in her book; also one of my reluctant girl readers mentioned it yesterday as a favourite book for her. As this year has been a year of difficulty for me in trying to hook in some girls to reading, I thought this is a good place for me to start. · The students need a wide variety of books to choose from – as each student will have differing tastes. D Miller has her own vast class library that she has paid for. I don’t have the time to build that library – I retire in a few years – however I have some books in our class library, we have a good school library, we visit as a class the local district library once a fortnight and we can loan 30 books from our National library for a 6 week time period. · She has a very good system for organising her class books. She does this according to genre and has a system of stickers and numbers that easily allow for additional books with no changing around of the books already there. I am going to organise the books I do have in the way she describes. It might not be until the summer break, but I will do it. · She has high expectations for her students. She sets the goal at the beginning of the year for the students to read 40 books. Read that is! She allows that a reader will pick up a book and not like it and its okay to discard. ( I notice on Goodreads she has her own shelf for such discards.) Next term, is going to be short, I think I will set 7 -8 books for my class. In February as we begin our school year, it will be 40. · She has an effective system of accountability. She has her students use a reader’s notebook and has a simple way of recording what they read. I like this and I am going to implement it next term. Once a week they write her a letter type response to the book they are reading and she replies to this. I need to explore that further in my second reread of the book. · She reads many children’s books so that she can match a student to a book. I am sure that’s not the only reason she reads them, she is obviously a booklover full stop! For me this is the most challenging aspect. I am a booklover too, but prefer to read what I like in my own time. As a result of reading this book though, I am going to change that, as I mentioned above. I highly recommend this book to all teachers, and as one teacher on Twitter suggests, all administrators!